As we found out when Michael Wolff’s instant bestseller Fire and Fury: Inside the Trump White House came out six weeks ago, all that happened last year. Wolff held down that spot for at least the first eight months of Trump’s insane presidency. Along the way, he interviewed hundreds of individuals familiar with Trump within and beyond the White House, including many senior administration staffers. The result was a book that quickly became an historical event in and of itself—a volume that will certainly make its way into future American history textbooks. 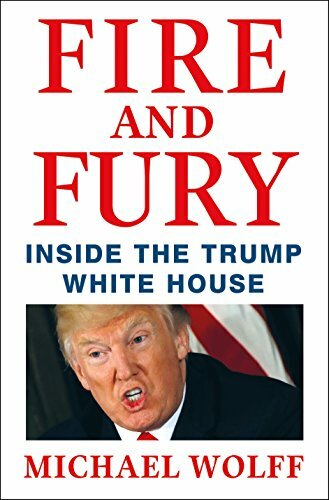 Packed with soul-numbing revelations on nearly every page, Fire and Fury is something of a Rorschach Test indicating what presidential (and not-so presidential) facts matter most (and least) to readers of different persuasions. Liberals and others hoping to find evidence on behalf of impeachment—on grounds of collusion with Russia and/or obstruction of justice and/or the emoluments clause of the Constitution—can find much to their liking in the book. He was often confident, but he was just as often paralyzed, less a savant than a figure of sputtering and dangerous insecurities, whose instinctive response was to lash out and behave as if his gut, however confused, was in fact in some clear and forceful way telling him what to do. In three pages of Fire and Fury, Wolff pastes in the mind-bogglingly moronic, delusional, and disjointed “speech” Trump gave at the CIA’s headquarters on the first day of his presidency—the one where one where the new president blustered that “we should have kept [Iraq’s] oil” and that “maybe you’ll have another chance” (to get “the oil”). It isn’t just Trump himself that Fire and Fury portrays as hopelessly vile and incompetent. The whole Trump White House is exposed as miserably dysfunctional, internally vicious, and absurdly leak-prone. Jared Kushner and his wife, the presidential daughter Ivanka Trump, are shown pushing Trump to foolishly fire Comey and to just-as-stupidly hire the malicious whack-job Anthony Scaramucci as White House Communications Director—an appointment that lasted 10 days when “the Mooch” predictably imploded in late July. Along the way, Kushner and Ivanka run their own media and public relations network to influence the president and counter the media machinations of their arch-enemy Steve Bannon, Trump’s first chief political strategist. Trump gets regular flattering media updates from his obsequiously deferential staffer Hope Hicks, his de facto daughter (Ivanka being de facto First Lady in the curious absence of Melania Trump). The laughably loyal lapdog Hicks succeeds “the Mooch” in the communications job at the age of 28. Here it is worth nothing that the Trump White House’s epic incompetence and disorganization is no small part why Wolff got to hide in plain sight in the West Wing in the first place. Power elite theorists and chroniclers attuned to the dominance of business and military chieftains in the making of U.S. policy can also find grist for their mills in Fire and Fury. Somewhat inadvertently, the book portrays a first-year White House torn between establishment globalist Wall Street centrists on one hand and revanchist, hard-right renegade capitalists like the hedge-fund billionaire Robert Mercer and the casino magnate Sheldon Adelson on the other hand. The Wall Street masters are represented by Treasury Secretary Steven Mnuchin, top economic advisor Gary Cohn, and National Security Council appointee Dina Powell, Goldman Sachs veterans all, along with Kushner (an acolyte of the blood-soaked globalist Henry Kissinger, curiously enough) and Ivanka. The renegade capitalists provided backing for the China-hating Bannon and his team of proto-fascistic staffers including Stephen Miller, a 32-year old PR hack who became Trump’s “political strategist” after Bannon engineered his own removal (by leaking to the crusty liberal commentator Bob Kuttner) in August. Ultimately, though, the main thing portrayed in Fire and Fury is an off-the-rails administration driven by the image-, media,- and attention-addicted narcissism and relentless prideful stupidity of a man-child president whose sole allegiance is to himself and to the defeat of those who fail to understand how great he is. Wolff sounds concerned about the constant media spectacle that is the Insane Trump Clown Show. Ironically enough, however, Fire and Fury itself quickly became a major chapter in the seemingly interminable Trump freak-show. “The problem with Donald Trump is not that he is imbecilic and inept—it is that he has surrendered total power to the oligarchic and military elites. They get what they want. They do what they want . . . Trump, who has no inclination or ability to govern, has handed the machinery of government over to the bankers, corporate executives, right-wing think tanks, intelligence chiefs and generals. They are eradicating the few regulations and laws that inhibited a naked kleptocracy. They are dynamiting the institutions, including the State Department, that served interests other than corporate profit and are stacking the courts with right-wing, corporate-controlled ideologues. Trump provides the daily entertainment; the elites handle the business of looting, exploiting and destroying . . . He is useful to those who hold real power in the corporate state, however much they would like to domesticate him. Another problem with Fire and Fury is that the book’s shocking depiction of just how truly terrible Trump is tends to fuel the same lazy, Lesser-Evilist “Anyone but Trump” approach that helped “Boss Tweet” defeat the noxious neoliberal Hillary Clinton—and that encourages the dismal, dollar-drenched Democrats to run yet another depressing Wall Street- and Pentagon-captive presidential candidate whose underlying loyalty to the nation’s economic and military rulers yields yet another terrible Republican presidency in, say, 2021 or 2025. Reading Wolff’s book, one is left with the strange sense that America and the world may have dodged a bullet of sorts with the oafish and venal Trump. An oafish plutocrat desperate to be liked, Trump lacks the moral and intellectual rigor, self-control, and fierce ideological conviction required to be the charismatic and iron-willed fascist that the sinister Steve Bannon would like to have installed at the head of a New American Reich. Trump is too venal, cloddish, and childishly egoistic to play that role. However terrible and right-wing the Trump presidency may have been so far, we can at least be thankful for that. We may not be so lucky the next time the deplorable corporate and imperial Democrats—the nation’s “Inauthentic Opposition Party” (to use a phrase from the late Princeton political scientist Sheldon Wolin)—hands the White House over yet again to the ever more apocalyptic, eco-cidal, and openly racist white-nationalist Republican Party. Criticisms aside, Fire and Fury is certain to be consulted and pored over by journalists, investigators, historians, political scientists, and many others for many weeks and years to come. The only thing worse than reading this chilling book is not reading it and thereby failing to fully grasp the depth and degree of America’s descent into madness as it lurches chaotically toward the third decade of the 21st century.